For business travelers, expenses are, well, expensive, both in terms of money and time. There’s time spent tracking down receipts, preparing and filing reports, and eating out-of-pocket costs for expenses you forget to file. So experienced travelers are always on the search for a tool that will simplify and speed up the task. BriteMac’s JetSet Expenses offers a thorough solution for iPhone and iPod touch users. Order From Chaos: JetSet Expenses simplifies the task of tracking and reporting business expenses. With JetSet, adding up expenses can be handled quickly. Touch the add button and you’ll see icons representing 15 different expense categories—airfare, hotels, meals, tips, and more. While recording details, you can use the iPhone’s built-in camera to capture an image of a receipt. Given the image quality provided by the camera, this feature is probably not as useful as you’d hope. You can also mark expenses as billable if you plan to charge them back to a client. Personal expenses can be tagged as non-reimbursable. Claiming mileage? JetSet allows you to enter actual odometer readings, as required by the IRS, and supports classifications for business, medical, and charitable mileage. If an expense is associated with an individual—lunch for a customer, perhaps—you can retrieve contact information from your address book. JetSet also offers a list of airlines, hotels, and rental car companies. You can call their reservation lines, visit their Web site, or associate one of those companies with an expense. World travelers will be disappointed in JetSet Expenses’ lack of multi-currency support, although BriteMac indicates the feature is planned for a future release. Despite that shortcoming, JetSet Expenses provides business travelers with a solid solution for tracking and reporting expenses. 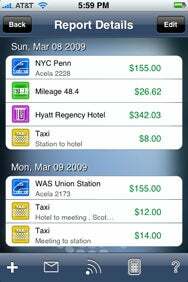 JetSet Expenses is compatible with any iPhone or iPod touch running the iPhone 2.2.1 software update.